In a classroom at Thompson Creek Elementary School in Dunnville, a veterinarian specializing in large farm animals is showing students the heartbeat of an in-utero calf on an ultrasound recording. Down the hall, an electrician is demonstrating how to safely strip a wire before students pick up a pair of pliers and try their hand at it. In another classroom, a paramedic is explaining the importance of strong communication skills when assessing the scene of an emergency. The professionals sharing their knowledge and experience are part of Career Day, a special event made possible through Thompson Creek Elementary School’s Student Council, which applied for a SpeakUp grant last December. SpeakUp grants fund worthy projects that promote engagement and success, and bring students’ ideas and brainstorming to fruition so they can determine how to positively impact their school community. There were plenty of career paths for Grade 7 and 8 students to explore; in addition to the veterinarian, electrician, and paramedic on hand at the event, professionals from the fields of culinary arts and management, floral design, hair styling, personal training, air traffic control, photo editing, firefighting, automotive repair, and policing also contributed their time and expertise to share with students. Each career path requires varying levels and types of training, from traditional college and university paths to more hands-on co-op and apprenticeship routes. The day kicked off with an inspiring talk from Brad Bell, who also shared his experiences as a disc jockey working in stage show entertainment. 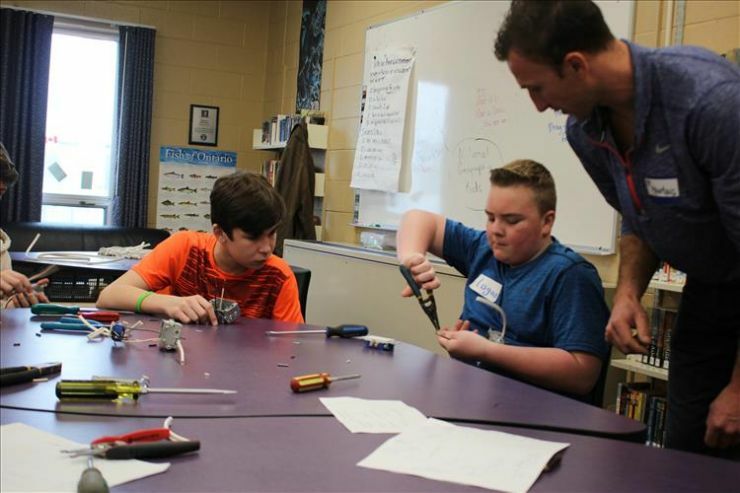 Logan, a student in Grade 8, is finding one of those proverbial forks at a workshop presented by electrician Ryan Maarhuis, as he successfully wires a receptacle with such concentration and precision that he impresses the pro. “I’m going to Dunnville Secondary School next year, and I definitely want to do a co-op to work with an electrician,” he says. Career Day was also a celebration of the Dunnville community, and the many partners who contribute to and enhance the learning experiences of students – a goal of Grand Erie’s Multi-Year Plan, which works to foster those connections through its Community indicator. All of the professionals work in Dunnville or within Haldimand County.